The Edison nightclub in Downtown LA draws people in with its glamorous 1920s decor contrasted with the gritty hardware of LA's first private power plant. It keeps them with great food, interesting cocktails, and entertaining DJs. 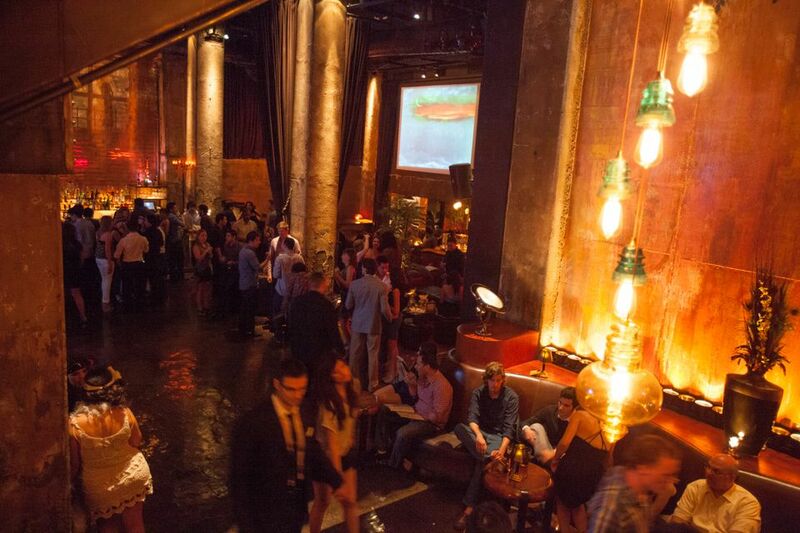 It is one of the coolest bars in Downtown LA, and really in all of LA. It can be pricey, especially the cocktails, but it has a nice happy hour menu that's actually pretty reasonable. The food is better than some of the trendy restaurants in the neighborhood and includes a full dinner menu as well as some bar snacks. The setting is interesting enough to make it fun for a date, a group of friends, or business associates. The Edison is open Wednesday through Saturday. Friday and Saturday are typically the big party nights and there's more "scene" then if that's what you're looking for. But be prepared for longer waits to get in when it's crowded. Wednesday and Thursday are the best nights for a quiet after-show drink if you've been to the theatre or a concert downtown. Happy hour from 5 to 7 p.m. Wednesday through Friday is a great deal. Wednesday is jazz night beginning at 7 p.m. There is a food/drink minimum per person for table service, which is $25 on weekdays and $50 on weekends, so if you plan on eating and ordering two or more $14 cocktails, go ahead and reserve a table to bypass the line. On a weekday, finding the entrance to The Edison in an alley near 2nd and Main can be like looking for a secret speakeasy, but on the weekends, the line gives it away. Once you're in the alley, an ornate wrought iron gate over glass windows masks the smoking area inside. The entrance is at the far end of the gate. Inside, the only thing at street level is the smoking lounge and a couple wing-back chairs in the lobby. The main part of the club is down a three-story staircase. The club is broken up into a number of diverse settings within a brick and concrete framework. The main stage area to the right of the stairs has a large movie screen playing mostly old black-and-white movies, with a number of smaller screens and DJ booth off the side of a mid-size dance floor. To the left of the stairs are a mix of romantic curtained brick alcoves and rooms that look like a steam-punk gentleman's club with electrical generators playing backdrop to luxurious leather lounge chairs and booths. Each major section has its own bar. As a peculiar addition to the decor, the men's and women's restrooms share a communal fountain-style wash basin that's in the public area of the club. The club has a refreshingly non-judgmental door policy, which enforces a strict dress code, but doesn't discriminate based on age, body type, or general looks, as some Hollywood clubs do. As long as you dress to impress, and are prepared to pay the applicable cover charge, if there is one, you can get in. However, dressing in sophisticated 1920s attire may get you priority entry if there is a line. Inside, you'll find a diverse patronage from millennials celebrating birthdays and new jobs to suits conferring over absinthe to boomer industry execs convening in library lounges. The common feature is that they're all very well dressed, many in retro 1920s glam attire. Drinks: The Edison is known for its vintage cocktails, like the Pimm's Cup and themed originals, like The Edison, a mix of Woodford Reserve Edison Barrel Bourbon with pear cognac, lemon, and honey or the Dead Man's Hand, made of Double rye whiskey, brown sugar, sarsaparilla, and whiskey barrel bitters with orange zest. Happy Herbie is a combo of Templeton Rye Whisky and baked apple bitters named for Disney Imagineer Herbert Ryman. The bar stocks a sophisticated collection of spirits, select beers and a very limited, but elite wine list. The champagne list is longer than the wine list. The winged Absinthe Fairy wheels a glowing absinthe cart around the club, so keep a look out for her if you'd like to sample the absinthe. For non-drinkers, an array of custom alcohol-free cocktails is also available. Food: The comfort food menu ranges from flatbread pizzas, grilled cheese, and pulled pork sandwiches to steak, prawns over grits, chicken and waffles, or braised short ribs. Snacks include Devil and Angel Eggs (deviled eggs with caviar), sliders, and an amazing truffle and parmesan mac & cheese as well as healthy salads and pan-fried dessert sandwiches.